Deep is good, right? Not when planting a tree. This tree planting guide will show you the importance of planting a tree at the right depth. Trees don’t come with an instruction manual, but they probably should. True, it's not rocket science, nevertheless, there are important things to know. Whether its planting bare root trees or balled and burlaped trees, one thing is consistant, most people do not know the correct planting depth for a tree. Probably the number one mistake we make is in planting the tree too deeply. Even nurseries are guilty of doing this. The problem is more serious than it appears. It all boils down to the roots and how deeply they are planted. This tree planting guide will answer that. When you purchase a tree grown in a container, the roots are already growing at the proper soil depth for the conditions. If you plant the tree at a deeper depth it will affect how the roots will grow from that point. Even an inch too deep on small bareroot stock trees is significant. The effects of planting too deeply often do not show up right away, but can appear several years later. Take a look at these tree planting guide photos above. The first two are oaks and the third is a Catalpa Tree. The trees above are not nursery trees, but are native trees growing on a small farm. 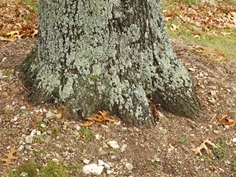 Notice the gentle curve of the root flare at the bottom of the tree? They are more easily seen in large trees like these, but all trees have root flares because all trees have roots. The top of the root flare should always be above ground. This root flare’s natural curve represents the place where the roots branch off from the truck. The majority of roots will be found in the top 10 inches of soil in large trees, so the curve sends the roots off in the right direction. 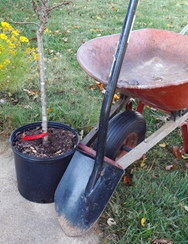 The dwarf peach tree in the photo is growing in the nursery container. It was started as a bareroot plant. How do I know? It was planted about an inch too deep. I brushed away the soil in order to find the root flare. Notice the blue arrow. It shows that the soil line was an inch above the root flare. The root flare is marked with a yellow arrow. I know an inch doesn’t seem like much, but the rootstock was probably only 18 inches tall and less than ½ inches wide when planted. In that situation, an inch is deep for such a small tree. The apple tree trunk to the left shows no root flare. The tree is approximately 15 years old. It was planted too deeply and very possibly has a root girdling problem below ground. One side of the tree is now dying and may need to be removed this winter. It will take some digging to confirm if a root problem was the cause of the dieback. This apple tree is now more susceptible to apple tree diseases or insect problems. Whenever you do not see any root flare you can suspect the possibility of girdling roots. What happens when a tree is planted too deeply? The roots of a tree naturally adjust to a certain soil depth. Roots will grow at a particular depth where they are able to receive water, minerals, and oxygen. 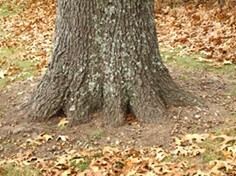 It is not uncommon to see the tree's root ball covered with a foot of soil. That is a foot too deep. The roots of deeply planted trees will search for water and oxygen often growing straight upward where conditions are better. Here's the problem. Roots should be growing out from the tree and not up. When they reach their upward height they do not know which was is out. They may grow back toward the trunk and then beyond. This creates a girdling root situation. Notice the girdling root in the photo. As the tulip popular continues to grow in diameter it will press harder against the root, possibly cutting off nutrients to that section of the tree. 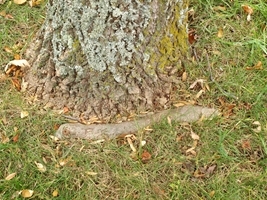 Girdling roots can slowly strangle a tree over time. Whether the tree is from bare root stock, a container plant, or a balled or burlaped tree, you need to find the root flare. You may need to brush away the soil to locate it. In small trees, the root flare will be small, but noticeable. 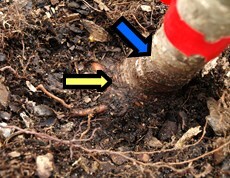 The root flare should be slightly exposed after the hole has been filled with soil. It may require staking to hold it upright. By exposing the flare, the roots should grow outward as they were intended and decreases the amount of time needed to anchor and establish itself in the soil. The best way to correct a girdling root problem is to cut the root. 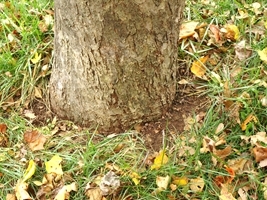 Roots do not move in the soil so it will need to be cut to keep it from harming the tree later. If the root is large and you are unsure how it will affect the tree, be sure to contact an arborist. In some areas, like where I live, a representative from the Dept. of Conservation will give you free advice. The conservation agent may not be a certified arborist, so be sure to ask if he as experience in that area. Pruning trees just got easier. Click on our pictorial guide that shows how to correct structure problems, how to prune young shade trees, fruit trees, and some small upright trees. There is a lot more to planting a tree correctly than most people realize. This page covers everything you need to know from choosing the planting location to amending the backfill soil. 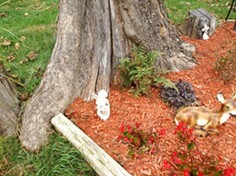 Introduction page to Lawn Care Academy's Tree Care pages.